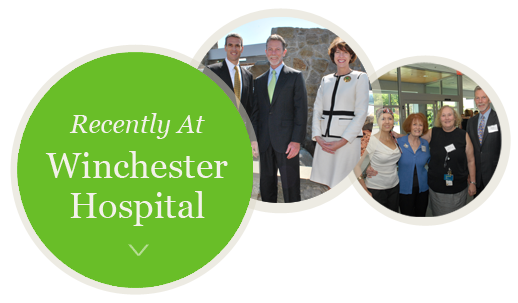 As a nonprofit community hospital, Winchester Hospital relies on the generous spirit of area residents to help fund the purchase of state-of-the-art equipment and the development of new programs and services. We are grateful to our donors, every gift makes a difference. The Grateful Patient program allows patients to honor physicians, nurses and caregivers. The program encourages businesses to help support the hospital, bringing leaders in the business community and the hospital together to consider, discuss and build collaborative relationships that strengthen and benefit our communities. At its 27th Annual Meeting, Winchester Hospital honored three recipients of the Eugene Joseph McCarthy Philanthropist of the Year Award at the Café Escadrille in Burlington. The award recognizes donors who embody the spirit of giving. Golf Fights Cancer, a non-profit organization that uses golf as a platform to raise money to fight against cancer, recently held a fundraiser at the Winchester Country Club to support the STAR Program® at Winchester Hospital. More than 600 corporate sponsors, health care professionals, and business and community leaders attended Winchester Hospital’s 13th annual One Shining Night Gala at the Renaissance Waterfront Hotel in Boston.